A new paper in Plos Genetics shows that a long non-coding RNA regulates the expression of a Hox gene in Drosophila in cis. This finding suggests an explanation for the co-linearity displayed by Hox genes between genomic arrangement and expression pattern. Hox genes are master-regulators of positional identity along the anterior-posterior axis throughout bilaterian animals. Hox genes are found in genomic clusters in which their 3′-5′ organisation mirrors their expression pattern along the A-P axis. This correspondence between body axis and genomic organisation is termed co-linearity. An important feature of Hox gene genetics is the phenomenon of ‘posterior prevalence’. In any given segment the gene that has it’s most anterior boundary of expression in that segment will define segmental identity. Hence, if that gene is not expressed the segment will take on a more anterior identity. 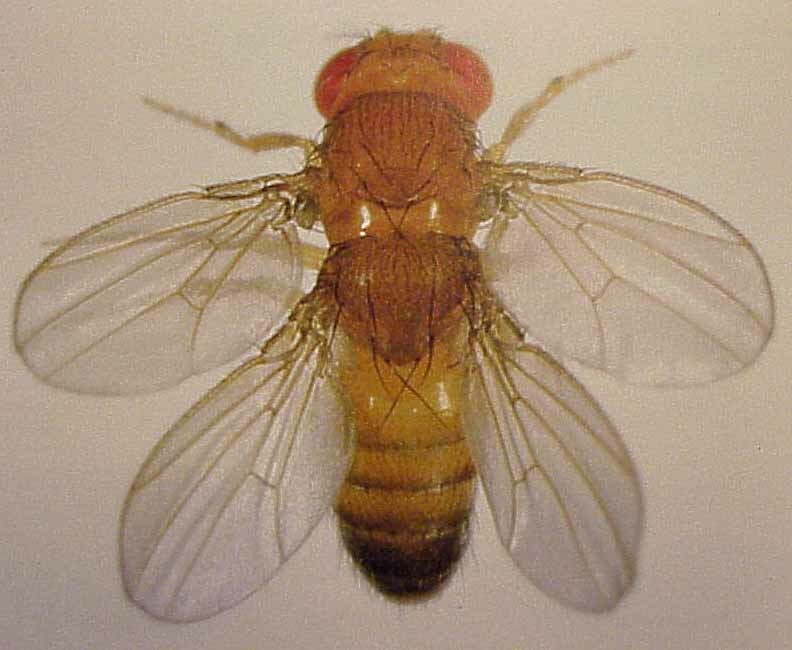 Perhaps the clearest example of this phenomenon is the Ultrabithorax mutant in Drosophila, in which segments that would have generated abdominal structures instead take on a thoracic fate, leading to flies with two sets of wings. The Hox gene cluster is actually divided into two partial clusters in Drosophila; the Antennapedia complex (ANT-C) and the Bithorax complex (BX-C). BX-C consists of three Hox genes responsible for posterior patterning in Drosophila, Ultrabithorax (Ubx), abdominal-A (abd-A), and Abdominal-B (Abd-B) spread over ~300kb, and has become a paradigm for the understanding on genetic regulation. Many transcriptional enhancers, maintenance elements (sites for the binding of Polycomb-group and Trithorax-group chromatin modulating complexes), and encoded microRNAs responsible for regulating the expression of the BX-C genes have been discovered. However, a complete picture of BX-C regulation is still far away. It’s been known since the 1980’s that much of BX-C is transcribed, but the significance of this finding is just emerging. Gummalla et al. have used classical genetics to characterise the role of one such non-coding RNA in relation to the expression of abd-A in the embryonic CNS. Figure showing the expression of ABD-A (red), and ABD-B (green) in the embryonic CNS. Note the gap in PS13, that isn’t filled by derepressed ABD-A in this mutant. 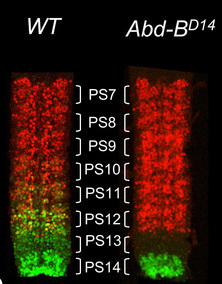 abd-A is expressed in the embryonic epidermis and CNS in parasegments (PS) 7-12 but is excluded from PS13. In line with ‘posterior prevalence’, this was considered to be due to Abd-B repressing abd-A expression. A mutation that removes Abd-B, shows expression of abd-A expression extending into PS13. However, this mutation also removed some of the sequence downstream of the transcription unit of Abd-B. In flies homozygous for more subtle mutations affecting Abd-B, abd-A expression only spreads into PS13 epidermis and not the CNS. Therefore, some function located in the genomic region downstream of Abd-B (termed iab-8), was necessary for abd-A repression in the PS13 CNS. Gumalla et al. knew that a long non-coding RNA (iab-8 ncRNA) was predicted to initiate in this area, and therefore set out to characterise it’s function. A map of the abdominal half of the bithorax complex. the iab-8 ncRNA is shown in blue (note exon structure). Abd-B, and abd-A are in black and the position of the miR-iab-8 is shown. iab-8 ncRNA is transcribed from virtually the entire region between Abd-B and abd-A, spanning 92kb. Mutations that truncate iab-8 ncRNA near the Abd-B end cause a derepression of abd-A expression in the PS13 CNS, but mutations affecting the end nearest abd-A display only subtle derepression. The difference between these two classes of mutants, appears to be the position of a microRNA encoded by iab-8 ncRNA, miR-iab-8. This suggested that miR-iab-8 was responsible for the repression of abd-A in PS13 CNS. However, mutants with this miRNA deleted did not display the complete derepression phenotype, rather a very weak derepression of abd-A. This showed that there must be a second, partially redundant function of iab-8 ncRNA, apart from producing miR-iab-8. To test whether a second miRNA or a small polypeptide encoded by iab-8 ncRNA was responsible for this second function, Gummalla et al. missexpressed iab-8 ncRNA from another locus in PS 8-13. This had no effect on ABD-A expression, suggesting that no other trans-acting factor is encoded by the ncRNA. They then performed some complicated genetic experiments that showed that iab-8 ncRNA acts to repress abd-A is cis. They generated flies that contained a deletion of miR-iab-8 on one chromosome, and a truncated copy of the iab-8 ncRNA on the other. These flies do not produce any of the miRNA, but still produce the ncRNA on one chromosome, and yet abd-A is derepressed in PS13 CNS. When flies are generated with one copy of the BX-C deleted, and a deletion of miR-iab-8 on the other chromosome, abd-A is not derepressed. The iab-8 ncRNA therefore acts to repress abd-A expression in CNS of PS13 through two different mechanisms: a trans-acting miRNA, and through a cis-acting process of transcriptional interference. Although it is possible that this process of cis-repression could act by iab-8 ncRNA recruiting gene silencing machinery that would act by heterochromatin formation or DNA methylation, the authors suggest that it is more likely that iab-8 ncRNA acts by somehow interfering with the abd-A promoter. This leads them to suggest that if this method of gene regulation was widely used within Hox clusters it could explain the link between posterior prevalence and co-linearity. In this case expression of a more anterior gene is blocked in posterior segments by a more ‘posterior’ transcript. Similarly an upstream ncRNA acts to repress Ubx (Petruk et al.2006). This method of transcriptional interference by readthrough of more posterior genes or by upstream ncRNAs would fix the arrangement of Hox genes in an ancestral cluster, and hence the co-linearity that is observed today. Uploading piRNAs to the Cloud. A chimeric fusion of RNA and DNA viruses.